Earlier today, our IT guy Neil came across a website here at work called cookingwithpoo.com. You read that right, folks. That’s Cooking-With-Poo-dot-com. He won’t tell us what he was searching for that led him to the site, but let’s just say we’re going to start keeping an eye on him and his search history. Anyways, we finally built up the courage and the stomach to click on the link to the site, and were immediately let down to find that it is just a website for a cook from Thailand named “Poo.” Well, not really actually. I’ll let her website introduce her; “Khun Saiyuud Diwong, affectionately known as Poo (short for “Chompoo” or rose apple). Yeah… makes no sense to me, but if the lady wants to be called Poo, so be it. 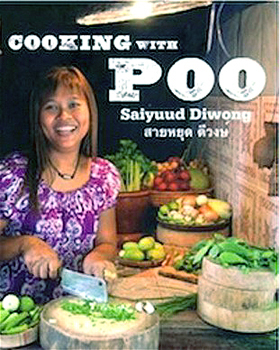 Turns out, Poo has a bestselling cookbook of the same name, a very successful cooking school, and a pretty strong following. Perhaps the misleading title of her book is an intentional attempt to draw attention to her business. Whatever their strategy is, it worked. So there you have it. As far as I can tell, she prepares delicious yet sanitary Thai cuisines. So get your mind out of the gutter. But for real, Cooking with Poo? What a crappy name for a book! Until next time, we’ll continue searching for absurd and potentially NSFW stories from the bottom of the internet until no more remain or we’ve all lost our jobs. Whichever comes first. That’s the One Fat Frog promise.